I Love Being Surprised With a New Review of My Book! As a fan of military fiction I have to admit that the genre is full of garbage: Boring Clancyesque white male protagonists fighting for god, mom, and apple pie. That's why "Hell and Gone" was so refreshing with its dirty dozen cast of real characters and real personalities. On the surface the plot appears to be standard-issue for the genre, Islamic whack jobs with a suitcase nuke, but characters carry the story and the plot turns out to be anything but what we expect from "techno-thrillers" or "men's adventure." As a former soldier I was also impressed with the authors attention to detail and general accuracy in regards to weapons and tactics. Every time I thought he slipped up I was proven wrong with what was described a few lines later such as the security situation when the protagonist arrives at his safe house in Sudan. The only small correction I would make is a scene where the mercenaries are shooting 1000 meter targets with 5.56 ammunition. With a M12A2 it is difficult hitting a bulls eye at 500 meters never mind a 1000 but this was a small detail and didn't distract from the quality of the story. I liked the descriptions of the mercenaries and found them accurate and true to life. This was particular true of some of the more unsavory characters who had a garrison mentality or bragged about ruining some lower enlisted kid's life. I've crossed paths with guy's like that to be sure. The disenfranchisement of some of the mercenaries also rang true, particularly Scarred Wolf's comment about officers viewing their soldiers as "assets at our disposal" rather then "warriors on our team." The protagonists comments about how shallow rich kids are exactly the type of fodder the military wants as officers was also dead on, thankfully a few good ones sneak through the cracks. The author does wear some of his politics on his sleeve regarding US-Israeli relations but that is his prerogative and generally his political views are well spoken throughout the novel without bashing the reader over the head with them. The novel had a awesome climax with a number of different parties vying for control over the ultimate prize. Even the ending was cast against type...still I hope to see a sequel sometime in the future. --What a pleasant surprise to see this review posted today. I thought I had made it pretty clear that only the M21 sniper rifles (7.62 NATO) were used on the 1,000 meter targets, but sometimes it is the author's fault when a reader misunderstands. I'll have to look it over again and decide if it needs different wording or something. But anyway, a nice review, and nice to hear from someone in my target audience. I finally got to see this film. Bravo! It reminds me of the screenplays I used to write while in college. I had aspirations of becoming a post-apocalypse auteur. The ending could have been better, but the journey getting there was a good ride. Denzel and Gary both played their roles well. There are certain film directors who are so obnoxious and arrogant in their craft that I strongly suspect their lofty reputations have more to do with hype than talent. Quentin Tarantino is probably in the top 3 on that list, for me. That's the reason I had no interest in watching this movie in the theater. Well, as often happens, I later second-guessed myself. I heard others describing scenes, then saw the trailer when the movie came to cable. Why not give it a chance, sez I. I initially had no interest in watching Saving Private Ryan or Love and Basketball, either, but boy am I glad I took a chance on them anyway. Tarantino still loves trying to shock his audience with bloody gore and prolific profanity, but perhaps he's matured a bit. I certainly wouldn't take my mother to see Inglorious Basterds (nor would I even mention the title, come to think of it), but I did enjoy the experience. I was pleasantly surprised at how 3-diminsional the German sniper in Enemy at the Gates was portrayed. Looks like QT took a page from that book. His villains are not just Germans, but Nazis...but not B Movie Nazis. "The Jew Hunter" had a dash of complexity, and it was downright disturbing what a pleasant conversationalist he could be. Yes, the audience just knows there's homicidal malice percolating under all his charismatic niceties, but it's far more sophisticated than it was with the Samuel L. Jackson character in Pulp Fiction. 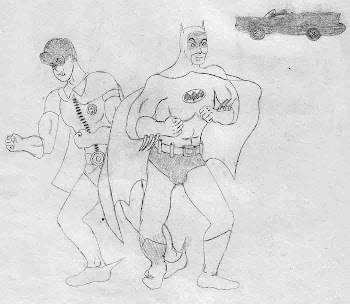 Jackson's mob muscle character struck me as steeped in stereotype--although a newer, fresher stereotype at the time. Now how in the world is it even possible to depict a ruthless Nazi like the Jew Hunter without resorting to stereotype(s)? It seems to me QT found a way. Oh, but I shouldn't limit my artistic dislike to QT--Brad Pitt is another Hollywoodite I don't care for. Pitt starring and Tarantino directing would normally be a guarantee that I couldn't possibly enjoy a movie. But I give credit where it's due: Pitt was the one of the few redeeming assets in the underwhelming Burn After Reading. And, like him or not (not, in my case), the actor knows how to play rednecks. His character in this flick is authentic throughout, and his hillbilly swag radiates through the screen in waves--even when his mouth is closed. The scene in which he is posing as an Italian filmmaker, demonstrating pronunciation for the Jew Hunter, is priceless. I have to give Pitt an A+ for this performance in Inglorious. I was almost ready to sit up straight and nudge QT off the Top 3 Platform of Most Obnoxious Filmmakers because of his handling of the German war hero...up until the end. Alas, no A+ for you, QT. But this is a solid B or B- effort. It was enough to convince me to take a chance on his next flick--whatever that's gonna be. Phillip Thomas Duck on his blog. He's posted a chapter from Virtual Pulp (specifically, an excerpt from Radical Times) and I urge you to check out that blog as well. Both Wisehart and Duck are authors themselves, and I wish them the best. Same goes to Scott Nicholson, who also spotlights/interviews indie authors. I should have some reviews coming up, soon, and hope to participate in a virtual tour. I'll keep you posted! I remember seeing later books from the Gor series on the bookshelves when I was a young G.I. on weekend passes, and thought them intriguing, but wasn't into fantasy at that point in my life. After I did begin to appreciate fantasy, I decided to start the series from #1 and fully expected it to be like John Carter of Mars, only perhaps better. There are similarities between this and Burroughs' John Carter of Mars, but it's certainly not better, or even as good. The adventure takes place on the "counter earth"--a planet in an orbit that keeps it perfectly opposite the earth and therefore hidden by the sun. A mysterious power structure called the priest-kings keep weapons technology stuck in the middle ages, while allowing other tech to advance even beyond present-day earth's. Norman rambles on at length explaining his world-building, which really tested my patience (but I would have forgiven this if the story had been better)--he obviously thought out those parts extensively. The big weak elements are character and plot. Tarl Cabot is a naive, gullible adolescent rube in the body of an action hero. There's a romantic subplot, of sorts, with a princess of an enemy city, but what they see in each other is a mystery to me. She despises him as a clueless wimp from the beginning, and as he proves himself even more of a clueless wimp, she falls in love with him. And he her. I guess because she was the first female character Norman tried to develop in this book, and he was too lazy to introduce another one. So far as that goes, I suppose he's following in the footsteps of other pulp writers. Tarl Cabot is romantic and grandiose in his sterling chivalry. His thick-headed foolishness is a plot device to get him into the obligatory perilous pitfalls, and dumb luck is the device which gets him out. In the climactic swordfight against Gor's greatest swordsman, Tarl is overmatched and just barely escaping a mortal wound, until Norman got bored or just decided to wrap things up. Then, without explanation, Tarl magically becomes the superior swordsman and wins the fight. I see this in Hollywood movies all the time, so I admit I was sick of it even before reading this scene. After reading some of the other reviews, I think I'll give the series 1 more try, starting with Assassin of Gor. This idea had much potential, but the execution fell short. I originally read this as a mass-market paperback titled Vigilante. I was just beginning to appreciate westerns at the time. I'm so glad to have found this. I subsequently bought and read the entire Reno series. Most were pretty good but I'm confident this is Morris' pinnacle in fiction. Jim Reno is a Confederate veteran, a reformed alcoholic and some-time "gunslick." He's also, like so many of us, spiritually lost...unsure how to fill the God-shaped hole in his soul. This is Christian fiction, but not preachy (or wimpy). There is one sermon in the yarn, which lasts for a paragraph of roughly three sentences. Christian characters surround Reno but, while it is no secret what the author believes, he doesn't sermonize. At his core, Jim Reno is a "good person" who has fallen short of exemplary behavior in his life, and who wants to get right with God, but spends a good portion of this series alternating between running from his Creator and surrendering to Him. Something I can relate to. I haven't read tons of Christian fiction, but I've read enough to be sick of the formulaic conversion of the main character at the end...reciting the sinner's confession, standing ovation, blah blah blah. One "bad person" does get saved in this novel, but Morris pulls it off deftly. I was so engrossed in the story I didn't see it coming. Morris likes to pepper his tales with romance, too. I do fault him for the way he shuffles love interests in and out of Reno's life. Between the first and second books in the series, for instance, his happily-ever-after soulmate disappears with no explanation whatsoever, never to be mentioned again. In this one, the love interest Morris spent the entire previous novel priming for Reno is unceremoniously kicked to the curb in lieu of a brand new one. The plot should be familiar to those who've read in the genre, or even watched western movies. A frontier town is at the mercy of lawless, greedy cattle barons and their hired guns. Decent folk band together in an attempt to protect themselves and the innocent, and turn to Jim Reno who has that rare (in reality) combination of a heart of gold and talent for violence. Reno, of course, doesn't want to get involved, for all the I'm-trying-to-escape-my-violent-past reasons. Whatever faults I could list here (and believe me: I could nit-pick ANYTHING if I put my mind to it), Boomtown is a great read. It is hard to put down. The bad guys will curl your lip, you will grieve for the victims, cheer for the good guys, and close the back cover with a satisfaction only the great books can give you. My introduction to Max Allan Collins was his graphic novel, Road to Perdition. As popular as that one is, I consider this one much better. Let me get the blemishes out of the way, first (my nitpicking self just can't help it): Though the author obviously knows more than I about mob/mafia history, he blundered the facts a little in the Bataan segment...AND pushed the limits of believability maybe a wee bit too far. Michael Satariano (AKA Michael Sullivan) is a troubled soul who, superficially, seems to be the perfect all-American hero. But his dark, troubled past makes it impossible for him to accept the pedestal. He is what Bruce Wayne would be like in real life (without the money). Like the Batman's alter-ego, he lost his family at a young age in a violent, traumatic fashion, to murderous criminals--and he thirsts for vengeance. The story opens on the Philippines prior to MacArthur's evacuation. Michael's heroism and combat prowess (dwarfing that of the Transporter and the most outlandish John Woo protagonists) win him the 1st Medal of Honor in WWII, and a golden ticket back stateside where the world is his for the taking. Haunted by his father's legacy and a lethal impulse triggered by his experiences fighting the Japanese, he dumps his perfect all-American girlfriend (who kept faithful to him while he was away), pisses away a wide-open world full of opportunities available to him, and follows a path of self-destruction. Elliot Ness is making a comeback in Chicago, and needs somebody to infiltrate the Capone mob. Without batting an eyelash, Michael signs on, and uses his Sicilian adopted father's Chicago connections to ensnare himself in the corrupt gangland leviathan. Ness' impossible guidelines are to avoid breaking the law while winning the trust of the top mob bosses. But Michael gets trigger-happy on his first assignment, becomes a "made man" inside his first year, and quickly works his way closer to the men who ordered his father's death. So intimately is the main character entangled with real historical figures like Ness, Al Capone, Frank Nitti and Sam Giancana, that you'll probably be tempted to do some historical research afterwards, to see just how much liberty the author took with facts. I am. Or you can just hang on for an engrossing, blood-splattered ride with a fascinating backdrop, while Michael's allegiances shift faster than a free agency era star-caliber NFL player's. I didn't realize this was fantasy when I found this used book at a flea market as a teenager... but then, I didn't know much about genres. I guess I figured it was a SciFi/time travel book, like an adult version of Conetticut Yankee. I certainly had no idea it was written in the early '50s and, until tonight, had no clue it influenced Dungeons & Dragons. I did find it fully enjoyable, engrossing, and leaving me wanting more when I finished it in record time. 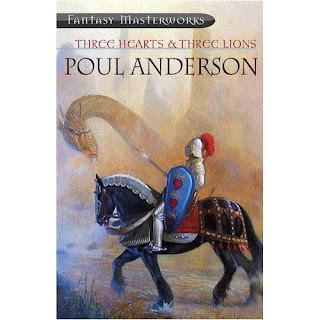 So much so that I bought other books by Poul Anderson (from his Flandry series) and was greatly disappointed. Maybe I should try them again, now. Howard and Burroughs took a few tries for me before I got in their groove, too. Anyway, I've read this a few times and will probably do so again. It truly does have appeal for all ages. The title, by-the-way, comes from the crest on the shield left for Holger along with his horse, armor and sword. I admired Holger Carlsen and the Saracen Carahue, enjoyed the fight scenes and was tickled by the riddle contest with the pseudo-intellectual giant (years later I paid homage to it in a fantasy short of my own). Throughout the tale there is an implication that the characters have been expecting Holger to arrive--like it was prophesied from olde or something. But this is never explained to my satisfaction. That's annoying, but I'm not one of these reviewers who's gonna complain because the female characters aren't amazon superninjas. If you want that so bad you can find it in pretty much EVERY fantasy, SciFi or action adventure, fiction or film, cookie-cuttered out in the last few decades. This was written before that became an ironclad requirement in the formula and, for that, I'm grateful. 3 Hearts & 3 Lions is flat-out FUN and makes me wish Anderson had done more like this. Nothing weighty today. Just wondering why people like and dislike the colors they do. What brought this to my attention (again) was some feedback I recently got about my website. I had already toned it down--besides the yellow in my banner, the only robust color on my pages was the orange background of my sublinks menu. It matched the orange on my book cover--a sort of motif. But even though the content of the site is black text on a white background, almost everyone found it too colorful. I've since changed the sublinks background to a more subdued hue, but this experience rekindled my confusion about why most people are offended by anything not dull, drab or bland. My big brother, God bless him, is one such person. He once refused to buy a house that was otherwise suitable because a food pantry was painted purple. Years ago, when my Windows 3.X computer had "hotdog stand" as the color scheme, he reacted to my screen like a vampire to garlic. His sneer of disgust was priceless. I'm sure he hates my book cover, as well. Another arena where this phenomenon is apparent is in the NFL. I happened to like the Tampa Bay Buccaneers' original uniform and logo, but 9 out of every 10 people I discuss it with refer to it as "stupid," ridiculous," or "gay." They consider the muddled red and mother-of-puke...er, pewter color scheme an improvement. From a distance, it could be confused with the San Francisco 49ers uniform. The emblem of a pirate with a dagger in his teeth was also replaced with what looks like a kindergartner's drawing of a Jolly Roger. How about the New England Patriots? I guess red, white & blue was too "stupid," "ridiculous" or "gay." Maybe we should change the colors of the American flag to (dull) red, silver & (bland) blue so as not to offend people. Then there's the Rams (I still think of them as Los Angeles...even though they started in Cleveland). Blue and yellow was just too bright, so they had to replace the yellow with vomit-tinted gold. Of course the Denver Broncos were too colorful. They minimized the orange and had to dull-down the blue. And the Falcons. I rather like black-dominant color schemes, and think their uniforms would have been very sharp if the old red & black scheme had merely been reversed. Nope--red is just too robust and had to go. I'm surprised the Minnesota Vikings, Kansas City Chiefs and Cincinnati Bengals have clung to their garish paintjobs for so long, but won't be surprised if they are one day replaced with turquoise, burgundy and silver. Guy Sajer was a unique individual to start with, born and raised in an area contested by France and Germany for many years. He had family ties to both sides and his worldview strikes the modern reader as an idiosyncratic, naive, homogenized nationalism. He was filled with pride, for instance, when the Vichy French joined the Axis--his 2 nations, fighting as 1 (as he saw it). But putting his convoluted motivations aside, Sajer wrote one of the best war memoirs ever--and about one of the biggest, bloodiest campaigns ever: WWII on the Eastern Front. His experiences as an infantryman should be required reading for every young man who imagines war to be heroic or glorious. His honesty about what he saw, did and thought is striking. The closest anyone in Sajer's auto bio comes to heroism is a man Sajer often refers to as "the veteran" (Wiener was his name, so Sajer undoubtedly did him a favor by dubbing him with that title). Sajer and the other soldiers came to depend on the veteran, who was a pragmatic survivor, almost never lost his cool, and had a keen grasp of the strategic big picture well beyond his tactical grunt's-eye-view. The men in his squad thought him invincible. "Combat fatigue," "shell shock," "post traumatic stress" or whatever you choose to call it affects every soldier differently, and I found it profoundly sad what happened to the veteran's mind by the end. The reason for the war on the Eastern Front was that one power-mad dictator wanted territory (Leibensraum) from another. But Sajer's story resonates with the experience of veterans of any war who endured heavy fighting and monumental hardships. If you've seen the movie, you need to read the book now to flesh out the ill-advised, ill-conceived and ill-fated military arrest raid into Mogadishu. If you haven't seen the movie either, watch it, then read this book. Mark Bowden did tons of research in order to piece together the events as they happened on that day. The Rangers and Special Forces (Delta Force) operators involved in that arrest raid and subsequent SHTF firefight experienced combat at a level of intensity and ferocity probably unseen by American foot soldiers since the Tet Offensive or, more likely, the Korean War. Bowden's investigative reporting, collected into one cohesive narrative, brings to mind Cornelius Ryan's work on famous operations of WWII. The overlapping point-of-view of multiple participants in modern battle is similar to Hell and Gone (though this is non-fiction). Why our armed forces were in Somalia is just as valid a question as why our troops are in Iraq now. But this is not a book about policies and politics...it's about men in combat. You also should read The Longest Day: The Classic Epic of D-Day (non-fiction). Seems like, at the French Dover landings, director Ridley Scott was trying to make a medieval Omaha Beach scene (like in Saving Private Ryan), complete with wooden replicas of WWII landing craft, underwater shots of floundering infantry helpless against a fusillade of arrows, etc. Cate Blanchett/Lady Marian served as the obligatory woman warrior, but wasn't quite the amazon superninja standard in action flicks. I am surprised, however, that Scott didn't choose a more physically attractive female lead. She did give a fine performance, though. Russel Crowe's Robin Hood was certainly heroic, but could have used just a touch more depth, IMO. Anyway, good flick. Go see it.